The valley Mengusovská Dolina takes its name from the village Mengusov, located south of it on the piemont of the Slovak Tatras. This valley is oriented from south to north and climbs some 500-600 meters, from the main road to the mountain hut Popradské Pleso ("Poprad" is the name of a lake at the source of river identically named, as well as the medium-size city some 20km far from the Tatras). Technically, this valley is not difficult to cycle at all, because it is asphalted until the end. The elevation difference and the steepness is the only difficulty. Most of the way lies under the forest, but in the last section, like most other valleys in Tatras, we enter the open landscape and have magnificent views to the high peaks. Near the end, on the right is located a small trail, going to "Symbolický cintorín"; this is a symbolic cementary devoted to pioneers who died in the Tatras. This place has something of merry and colorful, unusual for this kind of place, and worth seeing. In the end, you reach Popradské Pleso, whose shores you can cycle around. The start of the trail is in the winter resort of Štrbské pleso. Before (or more likely after) the ascent, you can also cycle around the lake located inside Štrbské pleso for the sight, as well as until the last point allowed in the other valley Mlynická dolina (until the end of the asphalt and the park sign). The trails climbs steadily until the end, with a S located somewhere in the middle. Horský hotel Popradské Pleso is a huge mountain-refuge with a lot of rooms and space, a restaurant, bar, almost like a hotel. Not the idyllic place for the one who seeks tranquillity in the mountains, but this place is far to be the worse for mountains huts of this size, and the building is beautiful and matches the landscape. Like all valley-trails of the Tatras described in this site, one of the main interest of this trail is to shorten the approch for the climb of many high peaks of the surrounding: Rysy (Poland's highest point, but reached from Slovakia), a bit overcrowded, but also Kôprovský štít, another gorgeous high peak more quiet, visiting on the way the largest lake in Slovak Tatras, Hincovo Pleso. A less challenging viewpoint is the modest Ostrva, red trail, east from the lake. Horský hotel Popradské Pleso, as far as I remember, has a free storage local, whose size can welcome bikes without problems. From the North (city of Cracow, airport), the best is to reach first Nowy Targ, then the direction of Jurgow, then pass the border, Podspady, Tatranska Lomnica, and then Štrbské pleso. 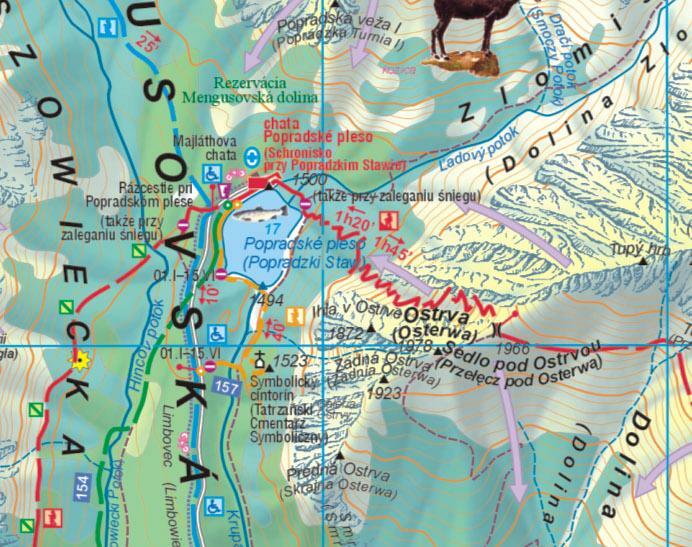 From the South (Poprad and Kosice are served with an airport too), reach Poprad and then Štrbské Pleso.